Microsoft has given us a sneak peek of the upcoming Office Web Apps. Using the cloud-based SkyDrive storage as a backbone, Microsoft Office Web Apps enables to access and work with Word, Excel, PowerPoint, and OneNote files using any Online Web browser from any part of the world. The Web Apps provide a platform for creating and editing basic office files via the Web. Microsoft has worked greatly towards ensuring that Office Web Apps render documents accurately in browsers without data loss or formatting issues. 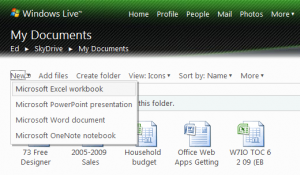 Compared to the desktop versions, the Office Web Apps are most definitely streamlined as they are meant to be. Office Web Apps come in any three different configurations, only one of which is available for testing now. The three version cater to different categories, namely, the general public, business customers and corporates. As promised by Microsoft in its press release, Office Web Apps enables one to view the documents seamlessly in the browser with great fidelity. With a few exceptions, every Word, Excel and Powerpoint file look exactly the same in the browser window as in the desktop program. Charts and PivotTables in Excel look indistinguishable from the versions saved on the desktop. All the controls in data tables and PivotTables to filter, sort, and rearrange data are very much usable in the browser. Web Apps are designed to create and edit, just the basic files. But anything more than basic becomes sluggish. The editing interface is familiar and is similar to the desktop version of the Office. 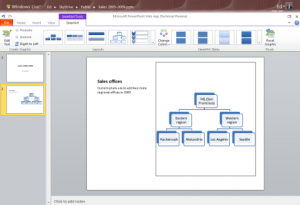 In PowerPoint you can create new slides with ease and even add SmartArt to create informational graphics and org charts. But the formatting of those SmartArt objects PowerPoint Web App is a big hassle. A very notable omission is the complete absence of transition tools for creating that trendy effect between slides or animating objects on a slide. The Excel Web App is good for entering text and numbers, but creating a chart is impossible. You cannot format the charts in a worksheet, although you can change the underlying data. Similarly, you can’t create or edit a PivotTable on the web. The biggest question everyone seems to ask is whether it will displace the Desktop version of the Office Suite and take its place. Based on the preview we have, there is no indication of that happening. The web-based programs are ideal for just sharing and basic editing, as their feature sets are too restricted to be competitive with the desktop versions.